Clark Regional Wastewater District commissioned a condition assessment on the Salmon Creek and St Johns Trunk reinforced concrete lines. For St. Johns Trunk, a 36-inch line, corrosion due to vapor-phase H2S was suspected and evidence was observed visually by CCTV. The District wanted to quantitatively determine the extent of corrosion and if/when future rehabilitation would be needed. Pipe penetrating radar (PPR) confirmed the upstream-most segment had corroding/missing reinforcement and reduced wall thickness. For the Salmon Creek Interceptor, 21-inch and 24-inch lines, visual CCTV inspections revealed the inner cement layer had deteriorated. In these pipe sizes, the District was unsure if the pipes had reinforcement. The PPR results confirmed that the 21-inch concrete sewer was unreinforced and the observed corrosion had structural implications. The 24-inch segment was reinforced and had uniform pipe wall thickness with sufficient rebar cover. Subsequent coring confirmed and verified the PPR pipe wall thickness. The objective of the PPR survey was to determine the condition of the RC pipes by mapping their wall thickness, rebar cover and detecting voids and/or other anomalies within or outside the pipe wall. This case study presents the methodology and results of the inspection. Figure 1. The inspection area at St. Johns Trunk (a. ), and at Salmon Creek Avenue Trunk (b.) Vancouver, WA. Pipe penetrating radar (PPR) is the underground in-pipe application of ground penetrating radar. 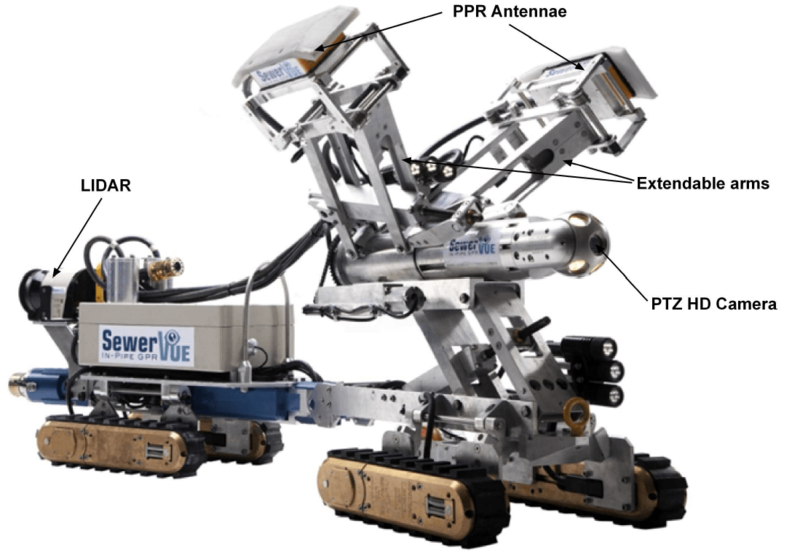 The SewerVUE Surveyor is the first commercially available multi sensor inspection (MSI) robot that uses visual and quantitative technologies (CCTV, LIDAR, and PPR) to inspect underground pipes (Figure 2). The PPR antennae were generally positioned between ten and two o’clock positions. Radar data were obtained via two independent channels providing a continuous reading on pipe wall thickness, rebar cover and locating voids outside the pipe. CCTV data were recorded simultaneously and were used for correlation with PPR data. The high frequency PPR data are of excellent quality. Signal penetration allowed analysis to a depth of 14 inches from the inside pipe wall surface. The most commonly used data display is the two dimensional depth slice which presents the processed data as an image of the pipe and its bedding material with anomalies that are associated with the objects of interest in their proper spatial positions (Figure 3). Figure 3. PPR inspection results showing wall thickness and rebar depth superimposed on the processed radar sections. Pipe wall thickness is marked by continuous black line, rebar shown as red lines. A more user friendly data presentation was developed for this project. The PPR inspection results are summarized on distance (feet) vs. pipe wall thickness and rebar cover (inches) graphs (Figure 4 and 5). These summary graphs are based on data extracted from the processed and interpreted individual PPR depth sections. The CCTV results showed concrete surface spalling and buildup above the water level for the entire 1,549 LF of the 36-inch RCP and two locations with visible infiltration at joints. 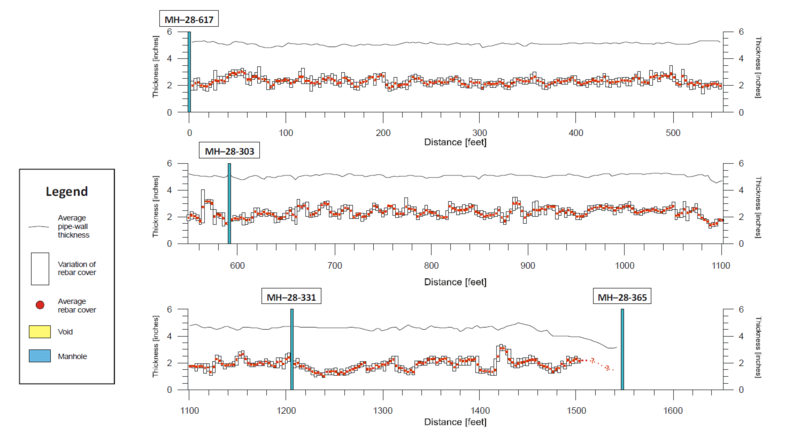 The graphed results show the summary results from the 10, 11, 1 and 2 o’clock positions (Figure 4). Figure 4. Summarized PPR results for St Johns Trunk. Pipe wall thickness is represented by a continuous black line. Change in rebar cover is represented by bar graphs showing rebar cover variations (min-max) for every 3 ft interval. Red dots mark average rebar cover for the same 3 ft interval. The PPR data indicate variations in pipe wall thickness, as well as location, depth and spacing of rebar. The results show that pipe wall thickness is around 5 and 5.25 inches, between 0 and 1085 ft. It is between 5 and 4.5 inches between and 1085 and 1460 ft, and between 4.5 and 3.75 inches between 1460 ft and 1545 ft at the upstream manhole MH 28-365 where corrosion appears most severe. Rebar cover varies between 1 and 4 inch. Rebar signal is weak between 1475 and 1505 feet and very weak or appears to be absent between 1505 and 1545 feet. A minor void was detected at 27.5 ft at 10 o’clock position. This void is approximately 4 feet long and 4 inches high. Overall, the majority of the 36-inch trunk line is structurally in fair to poor condition. Inspection of the upstream-most pipe segment revealed evidence of severe corrosion. The PPR data indicated less concrete rebar cover at the upstream section of the trunk line and a loss of wall thickness as the robot moved upstream. Assuming the initial pipe design considered the railroad loading and appropriate dead loads, the loss of wall thickness and suspected corrosion in the reinforcement indicates that the existing pipe may be compromised structurally. The entire 2,400 LF showed concrete surface spalling and buildup above the water level. The CCTV and PPR results showed evidence of infiltration at four locations. PPR results are summarized in Figure 5. Figure 5. Summarized PPR results for Salmon Creek Avenue Trunk. Pipe wall thickness is 3.25 inch with little variations. What is striking is the apparent lack of rebar. With the exception of 0 to 225 feet between MH 6-288 and MH 8-50 and 685 ft to 707 ft there appears to be no rebar reflection on the PPR profiles indicating that there is no rebar in the majority of the pipe. Where rebar is present it appears to be uniform with adequate cover and little variation in depth. PPR scanning did not detect any voids in the fill material around the pipe. The majority of the 21-inch-diameter portion of the pipe revealed evidence of concrete corrosion. The interior cement layer had either corroded or eroded, resulting in projecting aggregate. The initial PPR results were recalibrated with data from a follow-up man-entry pipe wall thickness measurement. The 24-inch segment that crosses underneath the Interstate 205 overpass revealed a uniform wall, a fairly smooth interior cement layer, and hardness commensurate with normal concrete. PPR also indicated that reinforcement is present in the pipe with adequate concrete cover. Overall, the 21-inch–diameter portion of the pipe is in poor structural condition and the 24-inch-diameter position of the pipe is in fair to good structural condition. 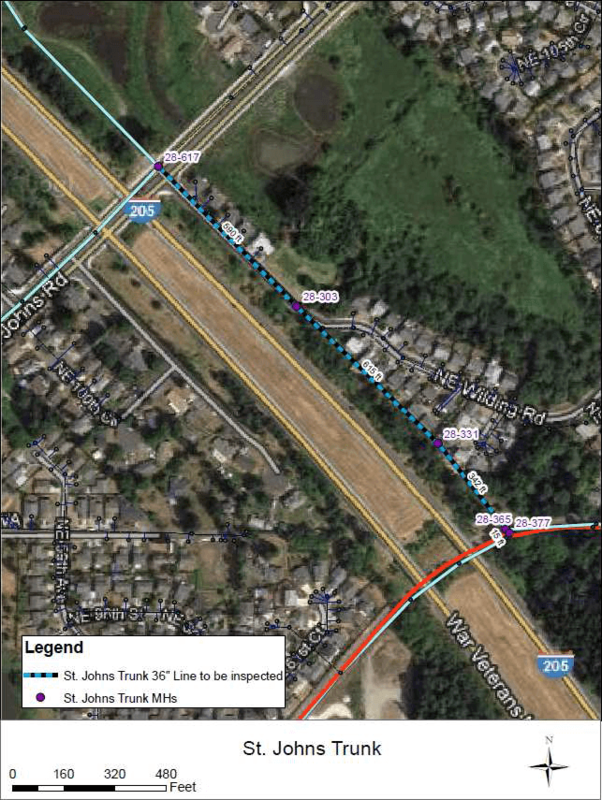 1562 ft and 2525 ft of PPR data were collected for St Johns Trunk and for the Salmon Creek Trunk respectively with the multi-sensor SewerVUE Surveyor inspection robot. 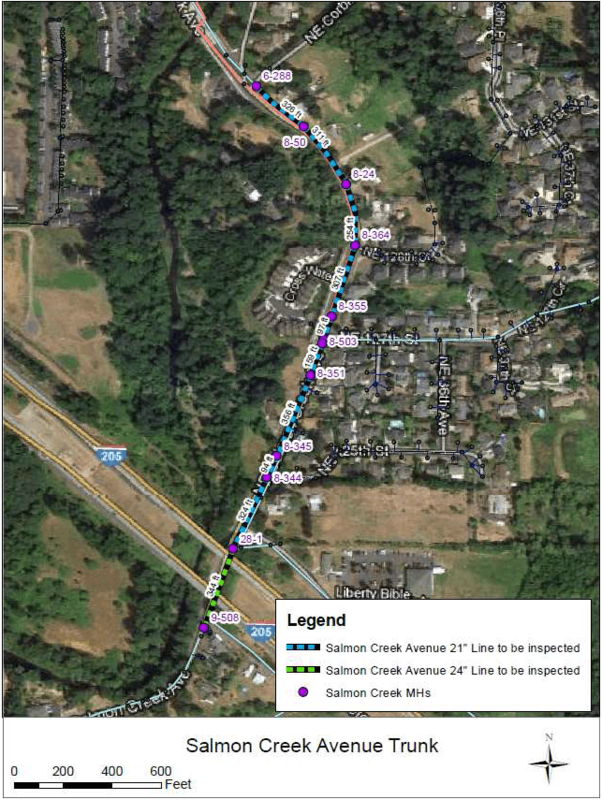 The Salmon Creek Avenue 21” Trunk is a concrete line between MH 6-288 and MH 28-1. Pipe wall thickness is in the 2.25” and 2.50” range with no significant pipe wall loss for this 2060 LF section. Subsequent drilling data was used to recalibrate the PPR wave velocity and adjust the pipe wall thickness accordingly. The pipe diameter is 24” between MH 28-1 and MH 9-508, pipe wall thickness is uniform and is in the 3.25” to 3.50” range with no significant pipe wall loss. Rebar, however, seems to be missing from approximately 336 ft of this pipe. Where rebar is present it appears to be uniform with adequate cover and little variation in depth. 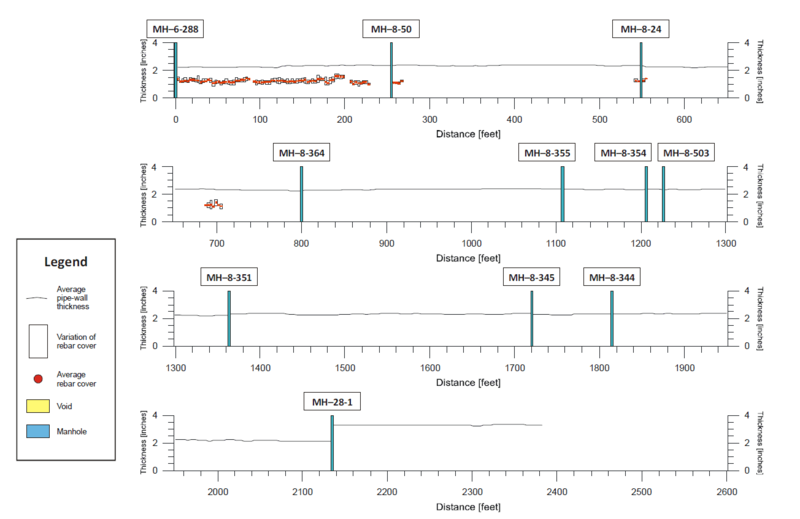 Analysis of 1562 ft of PPR data for the St Johns Trunk shows corrosion and pipe wall loss in the vicinity of MH 28-365. Between MH 28-331 and MH 28-365 pipe wall decreases from 4.75” to 3.25” and rebar signal appears to be weak or missing between 1475 ft and 1550 ft. Rebar cover shows a great variation between 1“ and 4” and appears to be adequate. No significant voids were detected outside either pipe. Subsequent coring confirmed and verified the PPR pipe wall thickness for the 24” RCP sections. The use of PPR combined with man-entry coring and visual CCTV data provided the necessary information for the District to understand the condition of these critical trunk lines. For the St. Johns Trunk, the lack of rebar signal and the concrete material scraped off during the PPR inspections indicate poor structural condition. This condition can be addressed trenchlessly before further deterioration renders a trenchless solution infeasible. For the Salmon Creek Interceptor, knowing that the 21-inch portion does not contain reinforcement is important information. Follow-up man-entry inspections confirmed that the pipe is in poor to fair condition; rehabilitation, while not immediately urgent, should be planned for in the near future. Dowload the .pdf version of this case study, including the appendix.